Linedry, acrylic on canvas, 10h x 20w, $700. Whiterocks II, acrylic on board, 24 x 24, $850. Camp, acrylic on board, 16 x 20, $750. Witchtrot Farm, acrylic on canvas, 18 x 24, $800. Undergrowth, 28h x 37w x 3d, $1200. Lilypond, 48h x 24w x 2d, $950. Fall Sidewalk, 12h x 36w x 2d, $700. Space Available, 30h x 32w x 3d, $1100. Midnight Promise, 24 x 36 x 2d, $800. Charles Hildebrandt was born and raised in Maryland, and moved to North Carolina in 2000. 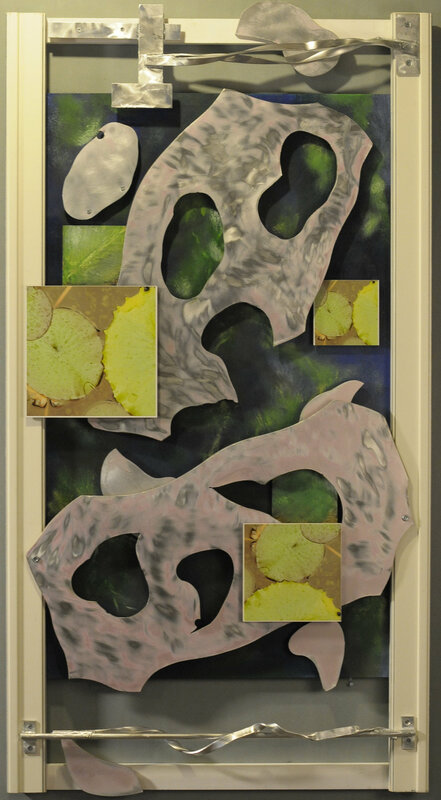 His work started in photography, but has grown to include mixed media collage and acrylic landscapes. 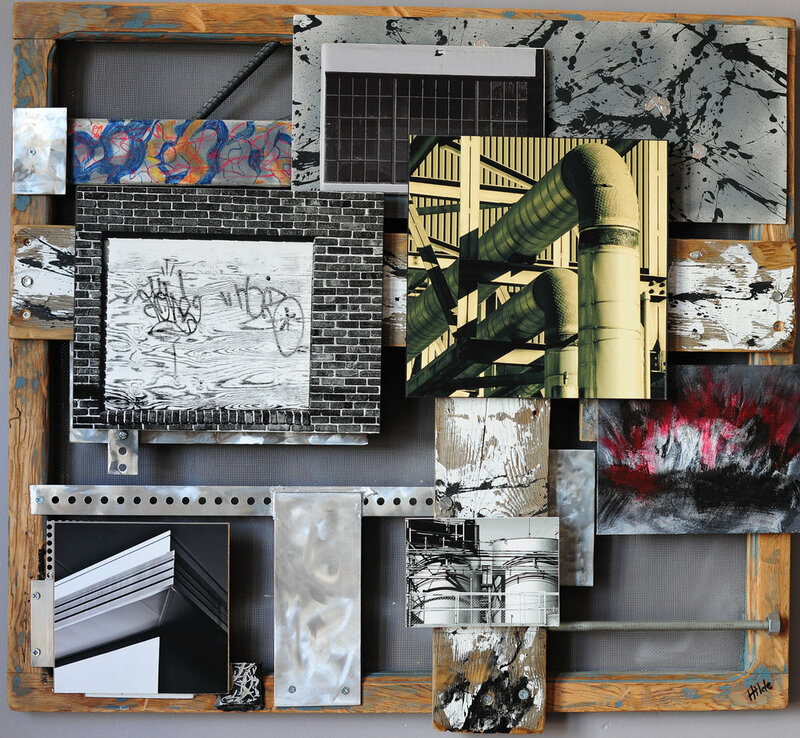 Many of his mixed media pieces involve his photographic work, but also include acrylic, sheet metal, and other materials. Hildebrandt completed a BA from East Carolina University in 1990, and a MLIS from the University of North Carolina at Greensboro in 2003. His work has appeared locally through shows at Associated Artist of Winston-Salem, and he received an honorable mention for his mixed media piece “American Farm Splendor” for the 2010 National Juried Show Dimensions. He is currently represented at 4th Street Art & Frame in Winston-Salem, NC, and has shown at Delurk Gallery in Winston-Salem, Principle Gallery in Alexandria, VA., and Viridian Artists in NYC. He lives and works in Winston-Salem, NC. Juried show based on author Warren Dunn’s book Indiscriminate Distinctions. Mixed media piece created as interpretation of book passage.